I have a problem that floors me every time. I can never make anything as beautiful as what is above. My art can never have such resonance, or such a reverberating heart wrenching affinity with so many people. I want to make art that people have a relationship with like they would with Joni's 'Blue' album or something. The beauty about music is that it can play to and alongside your most intimate experiences amongst multiple times, circumstances and places. Its relevance can be renewed easily, igniting all sorts of memories and emotional twangs. Visual Art keeps its distance or something, doesn't get so entwined. I want to make serious art that gets twisted into people's lives and makes them feel like I feel when I listen to Joni Mitchell music. 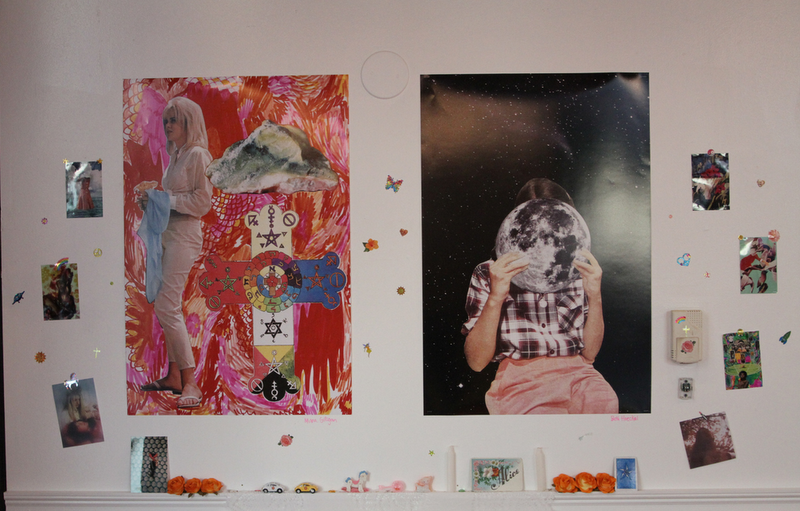 On the subject of my inadequate and flippant artistic endeavors here is a photo of my work (ON THE LEFT) in 'Strange Magic' at Space 15 Twenty in LA. WHY CAN'T IT MAKE ME FEEL PROFOUND THINGS GOD DAMMIT.